McDonalds and other fast food restaurants are starting to and have been marketing a “Healthy Menu”. But, is their new health oriented menu going to change the dynamic of the eatery. We saw McDonalds and others advertising a tasty and quick and affordable product. Now they started working the coffee scene and health scene. I think that they will soon begin to target health food as their main advertising campaigns. After so many years of marketing fast food—The Big Mac—people already know what McDonalds has to offer in that sense. But, it is a harder sell to convince people who are health conscious to go to these places to eat. It is also very hard to convince a Starbucks customer to go to McDonalds to get a Cappuccino. Although it is not impossible for these things to happen it will take time and money. Money is not a problem for McDonalds, the health-craze isn’t going anywhere and Coffee drinkers are definitely not changing habits. Plus, people who regularly eat at McDonalds are going to continue to eat there, they are basically loyal customers. I think McDonalds will start to target Health Conscious people, continue to target young kids and also coffee drinkers. It looks like businesses are bombarding consumers with offers to help them since the outbreak of the swine flu. Everything from travel insurance, air filters, chiropractors, and even T-shirts are being marketed to prevent a possible pandemic. Some people are claiming it’s unethical for businesses to exploit consumers on their fears of contracting the disease, but many of the items are valid disease preventives. Should people be running out to buy the SaniGuard Total Release Fogger yet? 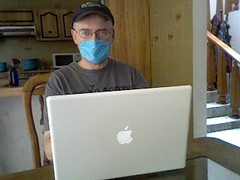 Let’s see first if the swine flu virus literally dies down.